Suffice it to say, there are many shocking incidents recounted here and it goes to show the levels that humanity will descend to in the name of a twisted ideology. lessons that are so relevant today in our troubled world. The story is well told and we even learn a little of the lives of the main characters after the war. My only gripe with this audio book was the production quality. Initially I thought that there was two similar sounding narrators as pitch and intonation as well as volume level of speech would change from sentence to sentence or even within mid sentence at times. Evidentially these were points at which the recording was cut and resumed but the overall effect is clumsy and is rather jarring when listening at times. other than that, the narrator does a fair job although I did detect some odd accent rendering when a Russian sounded a bit like an Irish accent or even a English northern one at times. 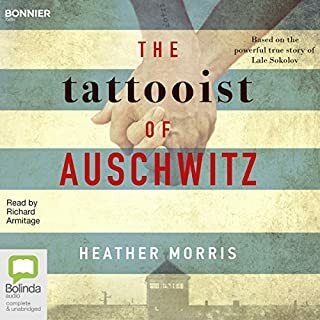 That minor gripe aside, the Tattooist of Auschwitz is a shocking account of cruelty but underlying this is also a touching love story. A recommended read. If You Think You've Had a Bad Day .... Try This! It took me a while to get around to listening to this book. I'd seen the movie and that was pretty good so I knew the book would likely be even better and indeed it was! The story alone would've encouraged me to get hold of this book but when I saw it was narrated by the legendary R.C Bray then that was the perfect match for me. I will forego my usual fairly lengthy review because suffice it to say that this is a superb story. It is a masterclass in problem solving, critical thinking and remaining calm under the most incredible pressure. I chuckled to myself that had it been me rather than Mark Watney, I would've died inside a week! If you think you've had a bad day then you'll think again when reading the plight of Watney. The author has with great skill woven a fantastically written tale that has so much credibility in it I had to wonder how much research he had done before putting this story together. Weir seems to be a new breed of writer that has greatly upped the level of what came before in terms of previous generations of writers and his fluid natural and well paced style reminds me of the flowing narrative of Craig Allanson and his Spec-Ops series of amazing stories. Pair this brilliant writing with the equally brilliant reading by R.C bray and you have a truly epic story in every respect. In my view, no other narrator I have heard thus far on Audible would do this story justice. I found the book better than the already good film as the reader gets more a sense of the thought processes going on in Watney's head that guides us through his amazing ability to reason and survive. One minor puzzling aspect that is a key element to the emergency situation the Mars explorers first encounter was the higher than expected wind speed. The MAV was tilting due to the 150 Kilometre per hour plus storm. However, and this is just my understanding, given the extremely rarefied atmosphere of Mars (it's atmosphere is about 100 times thinner than here on Earth) it would seem unlikely that wind speeds of even 200 Kilometres per hour would have anything like the force depicted so I have to wonder if this was some dramatic licence given here. Still, this does not detract from the excellent story at all. Reay, it's just me being, well ... me! 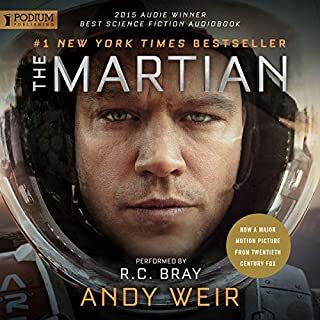 The Martian is a book that would appeal to readers outside the science fiction genre as it truly highlights the indomitable human spirit and the will to survive against all the odds. Utterly superb! To any paperback or Kindle readers out there; Do yourself a favour and get yourself the definitive version of this great story i.e the audio book. Some stories age well and others do not. Raise The Titanic is in the latter category. Not simply because the finding of the ship in question in 1985 and the state of destruction it was in rendered this story moot but the feel of the writing is very much of its time. This novel, according to the release year of the printed edition, was written way back in 1976 and it shows. 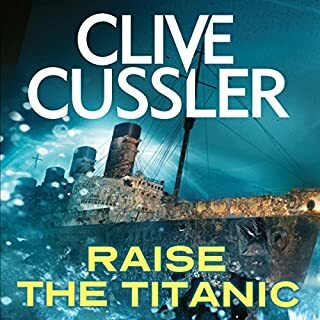 What sells this book is the Titanic itself and yet it is really only there as a secondary plot device for what this story really is, another Cold War espionage thriller. The story meanders its way along as the Americans desperately trace the whereabouts of the super rare element Bizanium. Like so many stories of this type and written in that era, the Americans and Soviets are highly cliched characters fitting the well worn stereotypes we have seen many times before. Now, this isn't necessarily a bad thing, it's just that there really isn't anything to make this particular story stand out from the pack within this genre and I feel that bringing the Titanic into this as really a bit of a cheap shot to sell the story. As you can tell by now, Raise The Titanic did not impress me at all. I found the Titanic elements so implausible as to really take any credibility away from this plot element.. Even if the wreck had never been discovered in 1985, any reader with a modicum of understanding of the engineering involved in raising such a large wreck from over 12,000 feet down would see all the flaws in the writing. In addition, the trapped submersible on the deck of the Titanic sub plot was also silly in its implementation as either the sub would've slid off the deck due to the hydrodynamic flow over it during ascent and the steep angle of the deck would drown all of the occupants anyway given their semi conscious state and just a mere 18 inches of air gap while on an even keel - just daft. I know that such novels require a degree of leeway but this just goes too far. Even the rationale behind one character eluded me given he went insane for no reason I could really fathom. His actions were just odd to me as well as his wife who one minute was desperate to save their marriage and the next was off jumping into bed with the alpha male in this story who, by the way, managed to make use of a bed "once the rot was wiped off it" within the old reclaimed wreck .... what, are you kidding me? I'm sure when first released this book may have been better suited to the audience at that time but it doesn't stand the test of time at all. As I recall and my memory is rather vague on this, I actually enjoyed the movie version of this more as it seemed to shift the real focus on raising the Titanic rather than have it as a book selling sub plot. Suffice it to say that if this is one of Clive Cusslers best novels then I shall not be bothering to read any more of them. I had heard of the old TV series, Cosmos, many years back and had caught snippets of that show here and there. I also knew of Carl Sagan as one of the luminaries of Astronomy and so felt I ought to have a look at what others have rated so highly. First off, my attention to the quality of this production was drawn to the superb if a little theatrical at times, reading of this epic work by LeVar Burton. Burton is an astonishingly good reader and delivers an effortlessly fluid reading. Those of you familiar with his role as Geordi LaForge in Star Trek: The next Generation may notice on one or two occasions his rendition of an English man rather like his version of Watson from Sherlock Holmes in that show. Burton is a pleasure to listen to and I cannot say enough about how well he handles this sometimes difficult material with precise pronunciations that do not seem to phase him at all. However, what struck me the most about this incredible work was how little of it is actually spent on discussion of the planets, stars and the nature of the universe in general. 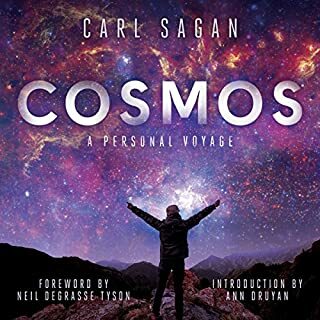 I had expected Cosmos to be a real deep dive into the workings of our Solar System etc but what amazed me was that Cosmos is much more about history and in particular ancient history. It reads more like a treatise on the history of the pursuit of knowledge rather than dealing with what we currently understand about astronomy. Sagan dives deeply into the various great men of science over the centuries and how their discoveries helped change the way we view the Cosmos. So, if you are wanting in depth analysis on Pulsars, Black Holes, our Solar System etc then this is not a work that focuses greatly on those elements. It does discuss these things but more as a secondary thread compared to the historical narrative. Still, the sheer scope of this amazing book will mean that the reader will likely learn quite a few things you did not know about the discoveries made in the ancient world. Yes, this is about the Cosmos but much more from an historical review of how the great thinkers of the past shaped our understanding of things today. A very enlightening read but some may decide to go elsewhere for more focused astronomical books. 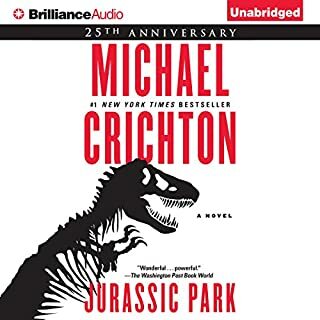 Having seen the Jurassic Park movie before reading the book, I assumed based on the seminal film that the book may actually pale by comparison so I wasn't expecting too much. Oh buoy, was I wrong! As is so often the case, the book version is superior and often greatly so compared to the movie version. Despite the movie being an excellent film, it falls short of this book's telling of the story. It really is something special when you expect little from a book only to find how great it is. This was what happened as mentioned above with me. I got this book as it was on sale at Audible and so i purchased it hoping it would be interesting but not expecting for much more than a repeat of the movie. I held off reading this for weeks until running out of other titles I had gotten in the sale so was blown away with what i found in the proverbial pages of this audio book. Firstly, I had heard of Scott Brick the narrator but not heard any of his work. Well, his reading of this was superb. He is not one of those narrators that can change his voice in any significant way so there is no real distinction between characters as he reads. However, the prose style of Crichton is such that you always know who is speaking and thus it is not a problem. Brick is able to create palpable tension in his delivery style when it is called for and the writing of Crighton is such that action scenes are fraught with tension and were thrilling to experience. The book packs so much action into it that there were a few times when I thought the story was winding down only to have something else come at the reader. It makes the movie version look much more sedate by comparison. I noted with interest that some of the action set pieces had been spread over several of the Jurassic Park movies so the screen writers did make use of some of the elements in the book they could not put into the first movie. The well known movie version differs in some details from the book but essentially remains true to Crichton's story. Some odd changes were there though in the movie which I don't know why were not true to the book. Some aspects of the children's characters were changed and I found the Lex character in the book to be particularly annoying. However, this only added to the tension at times so was well written in that regard. Very impressed with Crichton's technical writing. he makes the world of cloning and DNA work sound so credible and clearly has done a bit of background research here. Similarly, he has pretty much nailed the computer aspect too with is use of what was back then the ultimate super computer, the Cray XMP. I did find a few niggling inconsistencies here. Probably the main one was the lack of a moat in the Tyrannosaur paddock. It seemed that the only fence breached was one that for some reason no moat was present for. Strange as the mention of moats as a secondary layer of security was touted earlier in the story. Still, none of these really detracted from the excellent and thrill laden narrative. I also liked the way Crichton endowed various dinosaurs with behavioural attributes one could find very credible and no doubt took some inspiration from the natural world in which we live now to come up with characteristics for his creatures . Having said that, I did think he bestowed a bit too much intelligence on the Tyrannosaur. it would spend inordinate amounts of energy chasing what amounted to very small prey in the form of people which I do not really think an animal of such a size would do. Still, it all makes for a very compelling read and one that is thoroughly enjoyable. Jurassic Park is a book that just keeps giving in terms of the thrill ride it takes you on. All that is left is for Audible (at the time of writing) to get the sequel into its catalogue. A highly recommended read even if you're very familiar with the movie and very re-readable too given how well written it is. The Undying Mercenaries series has become just about my favourite series from B V Larson closely followed by the excellent Star Force saga. So, as usual, just as soon as I had the chance to pre-order Storm World, I did so. I have never been disappointed with any book in this series to date. Some have been better than others but none of them what I'd call bad. Now, if you thought that leads me to say that Storm World was disappointing you'd be wrong. No, just prefacing the point that not a "bad" book in this series exists. In fact, I'd say that Storm World is actually one of the better in the recent group of this series and, to me at least running to some 78 chapters, is a bit longer than is typical. This is a welcome change as we get more elements in this story than perhaps previous books. Our hapless hero, James McGill, has adventures on no fewer than three worlds and one of them is an old battleground and the other is a surprise. 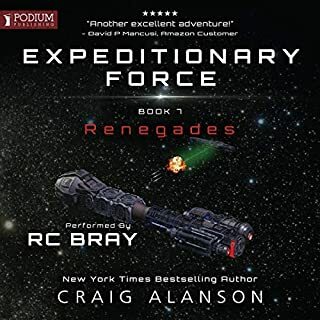 I don't think anyone that has read this series thus far is going to not want this book so I shall not go over again what it is I like about Larson's accessible form of military science fiction. We all know that Larson's style of story telling isn't "high brow" like other authors in this genre. Instead, what we get with Larson is straightforward, uncomplicated action adventure. Sure, some of the situations and solutions are rather simplistic but this is what endears the character of James McGill to me. He is a talented con man in his dealings to worm his way out of tight situations but I think I'd rather consume stories of this type if given the choice between something like this or other much heavier science fiction. Sure, the heavy stuff is often superbly written, profound and clever but it can leave you less entertained than these unpretentious action adventure format stories. Ive said it numerous times but this sort of story style would lend itself well to the big screen in a similar fashion to the 1998 Starship Troopers movie which I'm sure has inspired Larson as well as others to pen books such as this. Larson has produced a very entertaining story here with multiple threads and plot elements and it should offer a solid foundation to continue this enjoyable series far into the future. There is enormous scope and potential here with new alien races and if there's one thing Larson does well, it's aliens. He manages to come up with very imaginative creatures with their own traits, culture and personality and it's these that McGill so often uses to his advantage in dealings with them. So nice to see that the excellent Mark Boyett is narrating once more and he delivered his customary solid performance here rendering all the familiar characters as well as new ones which are also distinct and fresh. 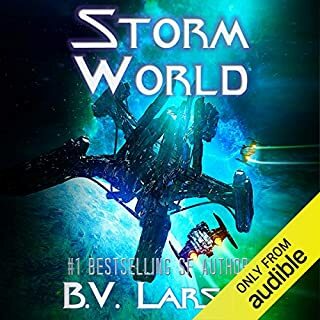 Storm World is another adventurous romp, with James McGill and his legion on another harsh planet facing an old as well as new foe. I can't wait to see where this series goes next. Another hit in my opinion and one of the best in the series so far. If you could travel back in time, the period from 1660 to 1700 would make one of the most exciting destinations in history. It's the age of Samuel Pepys and the Great Fire of London, bawdy comedy and the libertine court of Charles II, Christopher Wren in architecture, Henry Purcell in music and Isaac Newton in science. In The Time Traveller's Guide to Restoration Britain, Ian Mortimer answers the crucial questions that a prospective traveller to 17th-century Britain would ask. 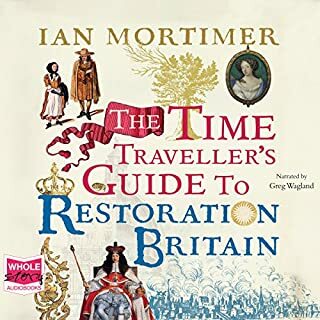 This is the third in the "Time Travellers" series by Ian Mortimer and is packed with detail about the period it covers (1660 - 1700). I like how Mortimer puts you, the reader, into the age at the start of the book and sets the scene for what is a mammoth journey through Restoration Britain. In some ways, this book is probably a little on the long side and has such fine details that it's title and overall target audience may be somewhat overwhelmed. Don't get me wrong, this is a deeply and painstakingly researched book and written in a very accessible way. However, to the casual reader of history, it can be a little on the long side. Perhaps if Mortimer had split this work into two volumes it may have been more manageable. The narrator does a superb job of reading this impressively detailed work and makes the listening of it very easy in terms of his voice and delivery. I like these books and they are indeed worth reading but I have found that as each book in the series is released that I enjoy it less. I really found his first in this series very interesting but in his second and third book, less emphasis is placed upon how life affects you as the imaginary traveller and falls into a general narrative of the period. This work draws much of its material from the diaries of Samuel Peepys and John Evelyn who kept notes of their day to day activities and provides historians with probably the best source material covering that period in history. An amazingly thorough book but a tad long for me. It's taken me a very long time to get around to putting together a review of Mavericks. The main reason for this is that I didn't know what to say about it. This series has been so consistently excellent that pretty much all I say here will be essentially repeating myself. However, I shall try. OK, some have suggested that readers of this series may not like this book quite so much as the main focus of it are the second group of humans based on the planet known as Paradise. This group had their own shorter story written about them in book 4.5 of this series. In my view, this book was excellent and this group of characters are written just as well as our main band of merry pirates. Further, in my opinion the author has been able to create two separate character groups because his overall stories are so good. Plus, there is always some form of connection to the plights of the two groups which Allenson is able to write for each equally well. I was so pleased to see the return of the lovable Nurt, the teen age furry alien member of the Paradise team. Some of his antics made me laugh out loud and he has become a firm favourite with me. If I were to offer any negative comments on this story then it would only be to note that in all the book there was just one part where the pace felt slow to me. This was the section of the book dealing with the characters moving to their training ship assignment. However, this was only a minor element which I only mentioned to provide some balance to my otherwise positive opinion of this book. I'll say it again, Allenson is such a natural writing talent and his words are perfectly conveyed by the superb R. C. Bray. So glad to find he has been doing all these books. A good narrator can lift a fair story and a bad narrator can make an otherwise good story unlistenable. Combine a great story and a superb narrator and you have a fantastic story which must be viewed as the definitive version rendering the mere Kindle or paper versions inferior. What bodes even better for this series is the ending of this story that begins the setup phase of something even bigger so I really look forward to that. This is another winner from the amazing Craig Allenson and a great addition to the series. 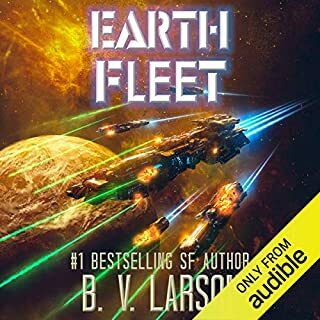 I like Larson's work but I have to say that apart from the first in this series, the Rebel Fleet books have been somewhat disappointing to me. The premise started well and I found it nicely paced and above all a page turner. It had mystery, action and was full of interesting character dynamics. However, once that first book was out the way I feel that the following instalments have been far less appealing with this and the previous in the series being below par for Larson in my opinion Sure, they are fine as basic stories go but they lack the punch and interest I've come to expect from this author. For all of this story's 60 chapters, I feel that not an awful lot happened. In other words, the overall plot was pretty thin and basic even for a Larson science fiction book. I do like Larson straightforward approach to his stories but this is a little too far in that direction. I much prefer his Undying Mercenaries saga which is far more appealing to me with its visceral life and death struggles and complex political machinations. In the Star Force, Undying Mercenaries and this Rebel Fleet series Larson's central character is very similar. He is both a ladies man and a trickster able to bluff his way out of dire situations. I suppose this might give his books a somewhat unpolitically correct alpha male lead character more reminiscent of the old Captain Kirk in his 1960's TV adventures which can be refreshing if rather simplistic in our more complex times. 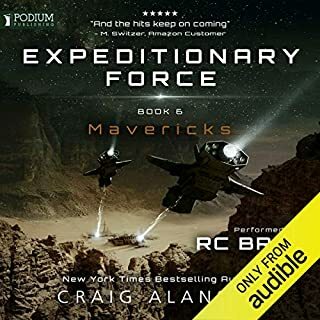 The Star Force and Undying Mercenaries books, however, make lesser use of these fundamental traits and so it makes it look as if Leo Blake is pretty much a one trick pony with little in the way of real depth. In itself this might be acceptable but what this story lacks is any real personal danger. I liked the first in this series and to a lesser degree the second as they presented Blake with personal danger having to use his wit and guile to fight off multiple foes. Not so here which is a shame. To me, it feels as if these series of books have become a labour of love for Larson perhaps as a result of some contractual commitment to complete a set minimum number of these, I don't know. Things feel a bit lacklustre as if Larson is on autopilot and is churning out something to be able to move on to something else. He is a prolific writer for sure but it can make for some sloppy errors in is writing such as near the start of chapter 41, I believe, where a nomad dissolves onto the deck of Devilfish when in fact they were aboard Hammerhead. Just a few sentences later it is mentioned that they are on Hammerhead so this, in my opinion, is unacceptable carelessness. I think there may have been another error but in fairness I cannot say for sure. It seems to me s if an injured bridge officer by the name of Ensign Costa was knocked out when her head hit her console but eventually awoke and remarked upon the situation at hand. However, in the following chapter she had died without mention of any complications as a result of her injuries. As indicated, I may have got this wrong but it felt that way to me and I have come across one or two other such similar types of fundamental errors in Larson's books. Having said that, it's not all his fault. Where were the proof readers here? Surely manuscripts are sent to publishing houses, read and edited or corrections made as required. Anyway, I'm rambling as I so often do. Suffice to say that Earth Fleet felt rather unsatisfying to me and it was a book I could pick up and put down for days before reading more which might indicate my thoughts better on it. Not a terrible story but a bit too simplistic for me.